Paulownia is capable of adapting, growing and developing in poor soils. It is an ideal tree for improving and reclaiming poor, polluted and endangered soils. Paulownia grows on soils polluted with heavy metals and harmful substances, where other trees would not survive. Absorbing these substances, it relieves the earth from them. Paulownia helps for remedying the fragile soils, which otherwise would perish and be lost completely. 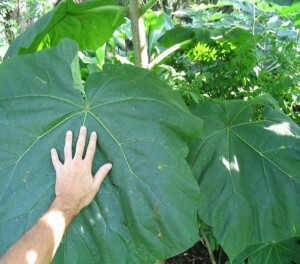 The huge leaves of Paulownia reach 50-70 cm in diameter. After falling they not only fertilize, but also restructure the soil with natural humus. 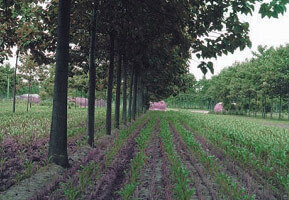 In this way, they ensure the necessary conditions for the growth of the species grown jointly with Paulownia and after. Paulownia is a preferred tree species also in fighting erosion. Besides purifying the soil and the waters in it, Paulownia clears the air of harmful gases, which are often in unacceptably high concentrations, especially in the large industrial cities. Paulownia absorbs 10 times more CO2 than any other tree species, releasing large quantities of O2. Human activity, the power industry, the huge traffic etc. bring about the fast accumulation of CO2 in the air, which in turn leads to global warming, the melting of polar ice and flooding the land. From the middle of the 19th century up till now, the level of CO2 has grown with more than 25%. Before that, such levels have not been reached for 1.6 million years. The cultivation of Paulownia on large areas contributes to the elimination of a part of the CO2. At the end of 1994, scientists found that most of the dioxides of Earth are absorbed by the younger tree plantations compared with the oldest such. With the planting of 4 acres of new areas with Paulownia, the absorption of 13 tons of CO2 from the air per year is ensured. 4 acres planted with Paulownia with the rate of growth around 4.5 m3 can absorb the CO2 from 6.4 million. cubic meters of air. The plantations of Paulownia can serve as sheltering belt from the strong winds and water streams in spring, when the waters from mountain snow melting are high. 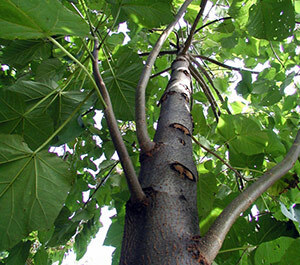 From an ecological viewpoint the use of Paulownia for biomass is important. The table below presents the emissions of harmful substances from materials used in the power industry, for fuel and for heating. The Paulownia biomass used for such purposes emits the lowest amounts of harmful substances. Paulownia improves the soil, controls the pollution of subsoil waters with heavy metals, chemicals and animal waste polutants, controls erosion, serves as shelter and barrier from the sun and winds, purifies the air from pollutants and releases large quantities of O2. Not least is the importance of Paulownia for the enrichment of the landscape and the biological diversity of the country.